Christine Busch was born in Stuttgart and grew up in Mössingen / Tübingen. As a scholarship holder of the Studienstiftung des Deutschen Volkes and the Deutscher Akademischer Austauschdienst, she studied with Wolfgang Marschner and Rainer Kussmaul in Freiburg, Boris Kuschnir in Vienna, and Nora Chastain in Winterthur. During this time she already had a chance to work with Concentus Musicus Wien (an inspiring experience with Nikolaus Harnoncourt and his musicians), the Chamber Orchestra of Europe, and the Freiburger Barockorchester. 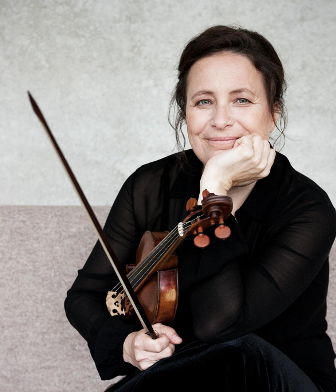 Since then she has enjoyed a successful career as a soloist and chamber musician on both ‘modern’ and ‘Baroque’ violin in concerts and at festivals in Europe, the USA, Japan, and Australia. She particularly enjoys working as Konzertmeisterin with Philippe Herreweghe and Collegium Vocale Gent and with Kay Johannsen in Stuttgart. Christine Busch made numerous CDs in the early part of her career, notably on harmonia mundi france, Dabringhaus und Grimm, and cpo, with such ensembles as Akademie für Alte Musik Berlin, Camerata des 18. Jahrhunderts, and Salzburger Hofmusik. Then, from 1997 to 2007, she recorded chiefly with Ensemble Explorations, in a series of releases on harmonia mundi france that included Rossini’s String Sonatas, string quintets by Boccherini, the Mendelssohn Octet, and works by Dvořák (the Bagatelles and the Piano Quintet op.81), played with the appropriate instrumentarium for the period of composition (the Dvořák, for example, was performed with gut strings and a Steinway piano dating from 1874). In 2003 Carus Verlag Stuttgart released J. S. Bach’s sonatas for violin and obbligato harpsichord (with Kay Johannsen), followed on the same label in 2005 by a much praised CD of the quartets of Joseph Martin Kraus with the Salagon Quartett, her string quartet, which also performs with instruments appropriate to the period in a repertory ranging for the most part between Haydn and Mendelssohn. She recently recorded Schubert’s piano trios and ‘Trout’ Quintet for et‘cetera with France Springuel and Jan Vermeulen. She also performs regularly with the Epos Ensemble in Austria. From 1997 to 2000 Christine Busch was a Professor at the Hochschule der Künste Berlin. In the year 2000 she was appointed to a post at the Hochschule für Musik und Darstellende Kunst in Stuttgart.